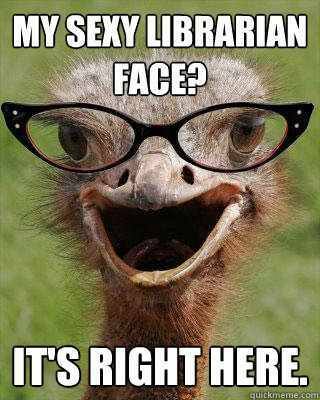 Judgmental Ostrich Bookseller/Librarian meme – still awesome or old news? Discuss! My library‘s holiday book tree – because, yes, I’m that kind of librarian. Be sure to check out my holiday post from last year, It’s a Wonderful Life: How Mary Lost Her Groove. Ah, nothing says Christmas like spinster librarians, amiright? Remember, you’re likely only a librarian because your selfish, crook of a husband wished he had never been born. Every time a depressed guy throws himself off a bridge, a woman loses all sense of self and ends up writing MARC records for the rest of her days. Ho ho ho. Let’s get this out of the way first: I’m not a big fan of anime. Friendly, furry tree spirits aside who like umbrellas aside, I’ve never understood the appeal. That said, I began watching Avatar: The Last Airbender with my husband, who is a fan of anime. Three or four episodes in, I became hooked. Aang and his group of friends are endearing, the story is magical and unique, and the world of the story is fascinating. In the same way that Harry Potter engenders the imagination, Avatar makes you think about our own world in relation to the make-believe, and it even allows you to match your background and personality with that of the different tribes. For example, I know very well (after taking numerous online quizes) that I’m a Ravenclaw and a waterbender. So there! So, forget about the travesty that was the 2010 film adaptation directed by He-Who-Shall-Not-Be-Named – in fact, forget I even mentioned it right here. The show is brilliant. Period. The second season of a follow-up series, The Legend of Korra, is currently airing on Nickelodeon. The story centers around the next Avatar in line after Aang, a waterbender named Korra. While it touches on a few of the same themes, it just isn’t the same experience for me. The world is similar, although “newer” and less rough, but the characters are older and more annoying. I don’t feel the same love for Korra and her friends as I did for Aang and his. We’ve been dutifully watching new episodes on Hulu, but without much interest. Lo and behold, I was quite pleased the other night when we sat down to watch the latest episode and one of my very favorite characters made an appearance: his name is Wan Shi Tong, and he’s an owl. Well, more to the point, he’s a spirit owl. Oh, and he’s a librarian. And his ancient library is amazing. The ancient library. I mean, LOOK AT IT. In the world of the original Avatar series, the ancient library was largely a mystery – no one truly knew where it was located, as it had been buried in the sand for centuries. Team Avatar (Aang and his buddies) needed to do some research about blah blah plot details, so they go out to look for it in the desert. In the end, they are only able to locate the structure because they happen to see a Knowledge Seeker enter the building through an opening in the desert sand. What is a Knowledge Seeker, you ask? Yes. Fox spirits. These knowledge seekers do exactly that: they travel the world looking for books to add to the ancient library. Even after the library is buried and all but inaccessible, they still fulfill their duties. They also assist patrons when they need to locate information. In these ways, they serve as both acquisitions and public services staff members, and they all serve Wan Shi Tong – the head librarian. Wan Shi Tong is the worst example of a librarian: he’s mean, territorial, single-minded, and spiteful. He’s the reason why the library is buried in sand to begin with, and after he encounters Team Avatar, he’s the reason the library vanishes all together from the human world. That he takes the form of an owl is no coincidence; owls often symbolize wisdom, which is a fitting animal for a librarian spirit. The barn-owl mask is also an interesting choice, because it gives him a stony, ghostlike expression that changes little. The actor who voices Wan Shi Tong, Héctor Elizondo, does so with a slight haughty grace, but it’s subtle and not cartoony by any means. His innate distrust of humans reminds me of a prickly, old librarian who has dealt with the public far too long and can therefore no longer trust them. (Remember: Librarians are Mean.) His main concern is the collection and protection of knowledge, which in librarian-speak makes him a kind of archivist. If that’s the case, he’s one of those paranoid archivists who dislike the idea of their precious rare materials getting in the wrong hands; soon enough, the “wrong hands” become “anyone’s hands.” Wan Shi Tong allows Team Avatar to peruse his library, but forbids them to use anything they find to aid them in the war against the Fire Nation. Spoiler alert: Team Avatar totally goes against Wan Shi Tong’s rules and as a result the ancient spirit Shuts. Down. Everything. Out of spite, he pulls his library from the human world forever. All that knowledge, gone. Despite his evilness, Wan Shi Tong and his library make for an incredible story. He’s a fan favorite character from the first series for a reason: you feel respect, awe, irritation, and terror at the idea of an incredibly old, intelligent, and diligent being who wants nothing more than to cultivate a mass of knowledge and keep it safe. His thirst for knowledge makes him lower his guard twice – once for the Avatar, and again for his descendent – and every time he does so, his belief in the folly of human-kind is reinforced. “Humans don’t want to learn,” he thinks. “They want to destroy.” Is he wrong? Is he so very wrong for wanting to keep his books – the very things he is meant to protect – out of the equation? Mean librarian, old librarian, evil librarian – sure. But what about tired librarian? Been there, done that librarian? Besides – how bad can a character be if he hires fox spirits to staff his awesome library? So you tell me: are you a fan of Avatar or The Legend of Korra? What do you think of Wan Shi Tong? How much do you want a pet fox now? Summer Movies Mean… Librarian Cameos? So, I see an awful lot of movies in the theatre. When summer rolls around, I can usually be expected to have seen one new film a week – not as much as post-Thanksgiving, pre-New Years, when all the Oscar-bait films come out, but still more than the average moviegoer. Sad films, happy films, funny films, weird films: as long as it doesn’t fall under the category “gratuitous slasher flick” I’m typically going to see it. And if I love it/hate it, I’ll talk about it. Forever. This past weekend my husband and I went to see Monsters University, which fell under the umbrella of “liked it, didn’t love it, but had some great parts.” For a sequel it was certainly strong, and it’s hard to go wrong with Nathan Fillion and Helen Mirren playing bad guys in the same movie. The film is very much a creation story; we see Mike and Sully meet during their Freshman year at school, quickly become enemies, begin to work together, learn from each other, and then finally become friends and colleagues. Monsters U, the school itself, is prestigious and honorable, and it has a typical division of clubs and cliques: jocks, hot chicks, emo kids, nerds, and weirdos. They’re all pitted against each other during the school’s monster triathlon, the Scare Games, which consists of a series of trials to choose the best Scarers on campus. One of the trials – called “Don’t Wake the Parent” – takes place in the university’s library. Can you see where this is going? I could, and it was glorious! The “Parent” in the trial’s scenario is of course the curmudgeonly, be-speckled, old lady/squid-like librarian who hates noise and has a penchant for chucking ne’er-do-well students into the lake outside. It’s over the top and silly and so much damn fun. She’s everything a Freshman might expect from their university librarian, especially if the university in question is as old fashioned as Monsters U. Look at all those books! The wood paneling! HER OUTFIT! Of course the library is destroyed when the librarian furiously lashes out, but you just know part of her enjoyed putting it back together again. It’s gloriously over the top (really, could they have made her any uglier?) but I just can’t bring myself to roll my eyes. Sometimes you just have to laugh. Reel Librarians had a great write-up of this scene, as well as other Comic Relief librarians, but I think it’s worth mentioning that perhaps the reason our profession keeps showing up in these summer blockbuster films is because the profession is immediately recognizable as light, good fun. We don’t need back story for why Monsters U librarian is so bent on shushing students – she’s a librarian! We don’t need to know why bow tie-clad Stan Lee doesn’t notice his quaint little library falling to pieces around him – duh, he’s a librarian! Like I’ve said before, sometimes you just have to laugh. What do you think? Have you seen Monsters University yet? Looking forward to the next Spider-Man? Do you think summer 2014 will bring us another librarian cameo? As petty as it now sounds, I took it as a compliment. It seems that even for the class of 2017, “librarian” means old, stuffy, and out of touch. While of course it means a variety of characteristics – because all librarians are unique, awesome snowflakes – I couldn’t help but thank the kid for insinuating that I’m young, friendly and do not smell like I own ten cats. I mean, that’s what he meant, right? How strange must his high school library experience must have been, or how many times must he have seen The Music Man, for him to point out how much I stick out in my line of work? I smiled and nodded at him, but in hindsight I wish I would have asked him what his frame of reference was, to whom was he comparing me, and oh bee tee dubs, mind if I blog about this? This line of thought makes me want to check out “You Don’t Look Like a Librarian: Shattering Stereotypes and Creating Positive New Images in the Internet Age” by Ruth Kneale. Has anyone read it? I feel like I need to commiserate with others on this point. My goodness, has it really been that long since I’ve posted? Just when I was starting to delve into the complicated world of librarians in popular culture, I went MIA. Even my post on Guybrarians and Male Librarians, which went viral and garnered thousands of views (!!!) and several dozen amazingly insightful comments, didn’t help cover my absence. I certainly want to get back to posting regularly – and I will! – but a little explanation may be in order. In mid-April I became a professional librarian. After nearly seven years of being an off-and-on-again student as well as a member of the support staff of a mid-sized academic library, I was promoted to the rank of faculty and the new position of Public Services Librarian in charge of marketing and outreach. It’s been thrilling and exciting and bright and shiny and new, but it’s also greatly taken away from my trolling on the interwebs online activities. Still, now that I am an actual librarian, this blog all of a sudden seems so much more important, so let’s forget about my brief disappearing act and get back to discussing why librarians are depicted the way they are in media and why that’s good/bad/wrong/hilarious. Okay? Morris Lessmore and his Fantastic Flying Books… or, what I thought being a librarian would feel like. Not so much? “Beware the lustful fires that burn in a librarian’s heart. According to this blog’s WordPress stats, the majority of search results that lead people to Pop Goes the Librarian categorize the profession as solely female. How do I know that? The list goes. Although “hot” isn’t exactly a gendered qualifier, when followed by the word “librarian” it might as well be. It’s fairly obvious to those of us who work in libraries that men are the minority. According to the article “Male Librarians: Gender Issues and Stereotypes“, “Without question the Library profession is female-dominated. Decade after decade the ratio of female to male librarians remains roughly 4:1, although the mix is closer to 3:1 in academic libraries.” This ratio rings true for my own library; out of the 16 professional librarians we employ, only six are men. So when we consider the main male librarian stereotype, what comes to mind? First we have the Mean Librarian. The horrible, no good reference librarian from Sophie’s Choice, for example, perfectly illustrates why librarians are so mean. There’s also the highly amusing Conan the Librarian, who isn’t afraid to tell us what is best in life. In many ways this figure closely resembles the Spinster Librarian image in popular culture: intelligent, introverted, socially awkward, academic to a fault, asexual, unmarried, be-speckled, etc. Think Rupert Giles from the early seasons of Buffy the Vampire Slayer; adorable in his tweed blazer, but largely socially inept and certainly hopeless in the love department. The fact that he’s British, prim, and mostly unskilled at slaying vamps (again, we’re talking seasons 1-2 of Buffy) only exaggerate his emasculated characteristics. However, a woman being written/portrayed as asexual is one thing – poor girl, so sad, but maybe she’ll find her prince charming one day? (*cough* Marian did *cough*) On the other hand, an asexual man in a largely female-dominant profession can only mean one thing: he’s gay. Male teachers (K-12), male nurses, and male librarians all share the common thread that there’s something wrong with them, simply because they’re men working in a woman’s world. Who in their right (heterosexual) mind would do that? The term “male nurse” is just as sexist as “guybrarian” is, simply because it creates a distinction based on gender. Etymologically speaking, “nurse” and “librarian” are not inherently female terms, but we tend to recognize them as just that simply because of what we’re exposed to. After all, most nurses and librarians are women. Remember Meet the Parents, in which Robert De Niro’s uber male character constantly reminds his future son-in-law of the fact that he’s a male nurse? He’s doing the work of a woman, so obviously he’s unworthy. I’m obviously speaking as a woman, so it’s best not to get too political here. I will say that the term “guybrarian” does seem to set teeth on edge, if only because it creates a cutesy distinction where one isn’t needed. When we think of pop culture, however, the male librarian figure isn’t nearly as prominent as the various female representations. My favorite librarian in literature (Lucian from Neil Gaiman‘s Sandman series) admittedly fits the guybrarian stereotype perfectly – but, alas, I’m saving him for another post. But who else is there? Are there any other librarians-who-just-so-happen-to-be-men in popular culture who fit the stereotype? Which ones buck the trend? BTW, for some real-world context and examples, Agnostic, Maybe has a very interesting thread from late last year dedicated to Gender, Librarians, & Librarianship. 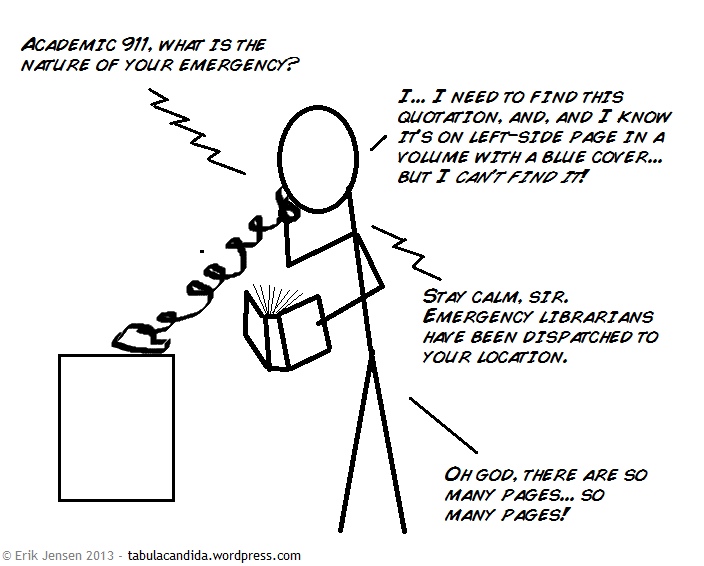 Where are the emergency librarians when you need them? My name is Maria. I'm a librarian and a huge nerd. I live in Florida. In my spare time I read, cook, and examine prim, nerdy and crazy librarians in pop culture.